Ridding the oceans of plastic waste is no longer an ecologist’s pipe dream. The Ocean Cleanup system, designed by 20-year-old aerospace engineering student Boyan Slat, is soon to be deployed off the coast of Tsushima Island in the Korea Strait. At 6,600 feet in breadth, it will be the longest floating structure ever deployed on the ocean and yet be sufficiently energy-efficient as to sustain itself and even generate profit. 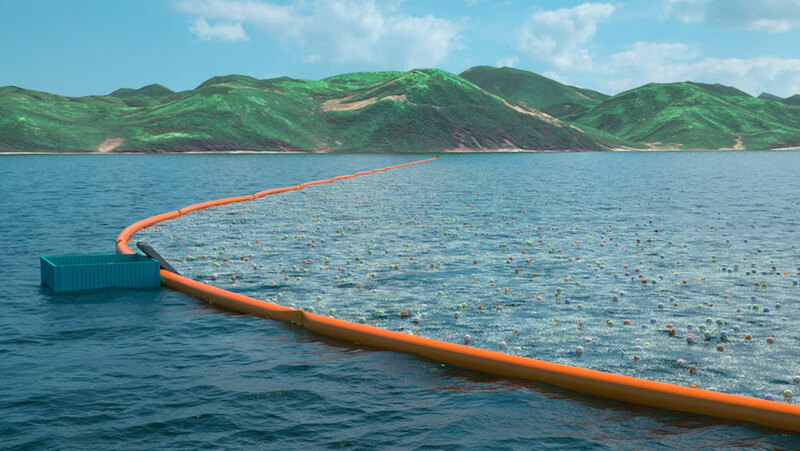 The contraption harnesses the ocean’s natural gyres (five circular currents throughout the world’s oceans—two in the Atlantic, two in the Pacific, and one in the Indian Ocean), to trap plastic flotsam. It uses a seawater processing station fixed to the seabed to collect waste as the ocean moves around it. 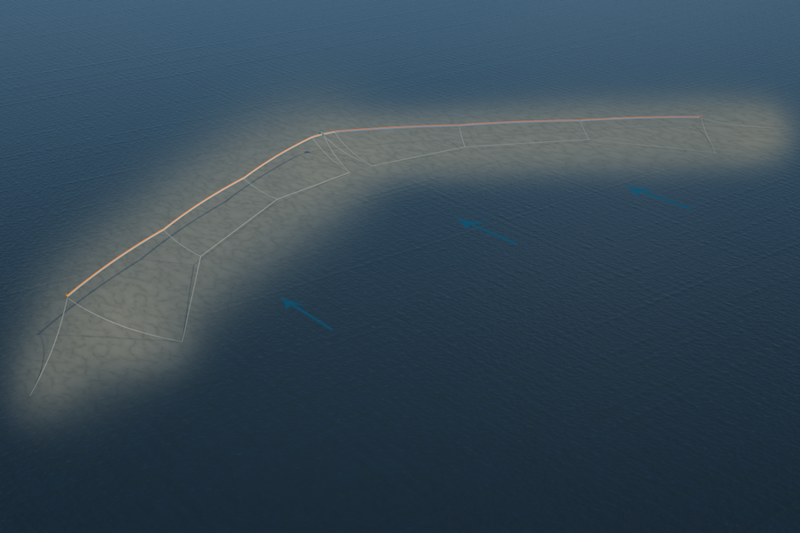 The station will have large booms instead of nets to allow marine life to safely pass beneath the system. The stationary platform itself will be powered by solar energy or kinetic energy derived from the current. According to Slat, the accumulated plastic may even be sold to make the model profitable, or converted into oil provided that the plastic has sufficiently degraded. The Tsushima government is currently investigating the feasibility of the latter. 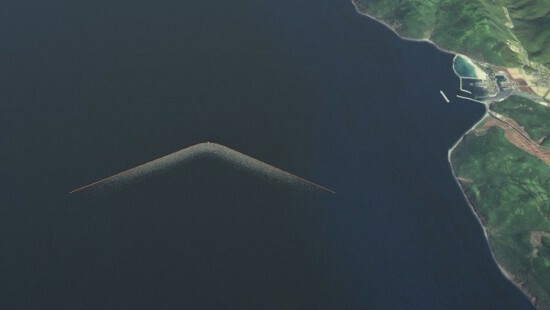 Data from the Ocean Surface CURrent Simulator (OSCURS) projects that the Ocean Cleanup can eliminate 7,991 tons of plastic within five years. “According to current estimations—due to the plan’s unprecedented efficiency—the recycling benefits would significantly outweigh the costs of executing the project,” Slat wrote on his website. The project has thus far completed a feasibility study, a crowd-funded pilot phase in the neighborhood of $2.1 million and will be deployed in the second quarter of 2016 in waters bisecting Japan and Korea. 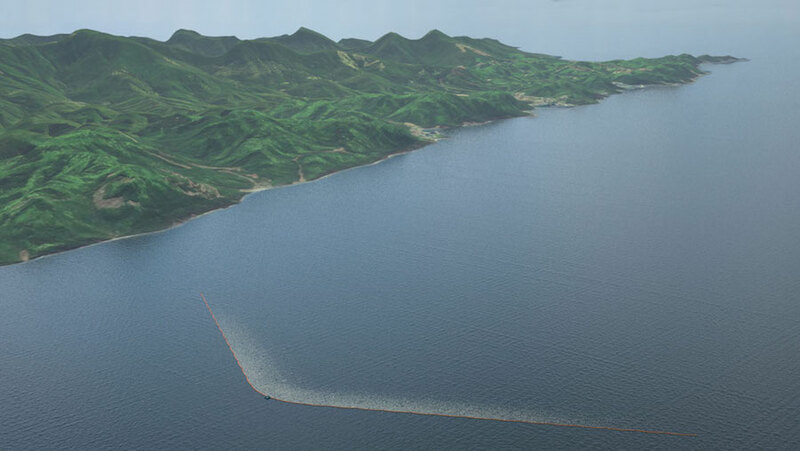 Within five years, Ocean Cleanup plans to deploy a 62-mile-long system to passively clean up 42 percent of the Great Pacific Garbage Patch between Hawaii and California within 10 years. The trash vortex is made of a concentration of microplastic particles which float on or a few feet beneath the water, giving it the appearance of a cloudy soup. Thus the patch itself is not visible via satellite imagery.